Can it really be true? March 8th was the last time I posted? How is it that it is the 21st already? Am I getting slacker or is life moving a little to fast for me these days? It couldn't possible be the fact that I have my fingers in to many pots?.....no, that is not possible! 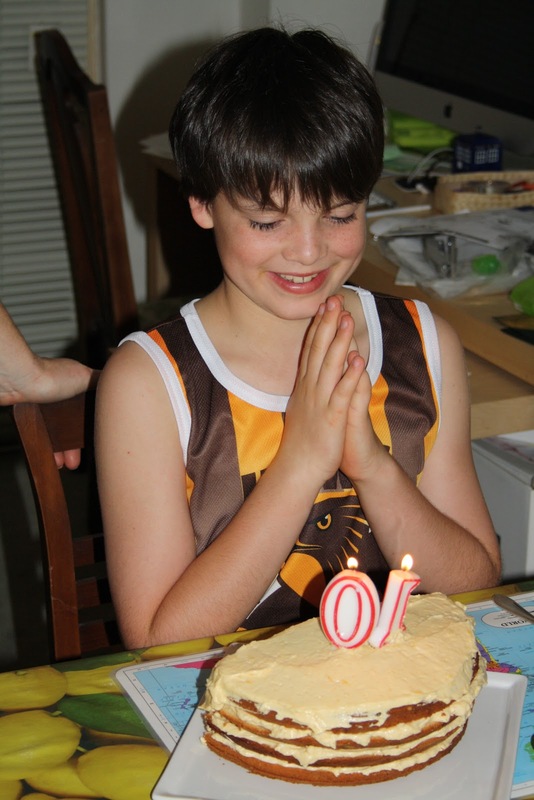 Well between the 8th and the 21st my eldest managed to turn 10. Yep, I can hardly believe I am now the proud owner of a ten year old. I am thankful that he doesn't yet smell of boy germs, he still knows how to smile and laugh on occasion and will have a conversation with me that doesn't involve grunting or starting the sentence with "Oh come ON mum!" or "What the......?" No, I am happy to report I catch him grooving away on his headphones to the latest tunes (thank god for headphones) and he manages to hold a conversation at the dinner table that doesn't revolve around Pokemons! Just like every other year Max chose his birthday meal. I thought I could of been in for a new selection of foods, alas, beef lasagne won hands down and I think it will be on the menu for a few more years to come, especially if he keep on growing the way he is. Max's cake was another story! Thankfully my copy of Saveur arrived the week before his birthday and it was the issue FULL of awesome Southern cakes. Max's favourite cake is lemon cake. I usually make him a regular pound cake and then fill it with lemon curd, and then Nic does a cool design on the top. This year was a little different. When I showed Max the four tiered layered lemon cake in Saveur he was sold on it and so was I.
I'm not sure if this is the year when we stop doing novelty cakes for him but there was no way I was carving up this one and dousing it in hideous food colouring so it can look like a football! Now I totally admit that my photos do not do this cake any justice and for that I am annoyed but let me just tell you it tastes unbelievably good. I'm not sure you noticed the picture up top, but I only made half a cake. After reading 10 egg yolks and mega mounds of butter I decided the four of us really didn't need to stuff ourselves on cake for the next week. It may not look normal but let me tell you, we would of demolished the whole thing if it was there and my hips can only hold so much! If your up for a bit of layering, baking and whipping then go to Saveur on line and give it a go, you won't be disappointed. Well, if it's from the South, then it must be good! And it is definitely lemon season, I can just taste the tart goodness. Happy birthday Max. And seriously, a 10 year old. Crap, I'm like old enough to be your mum!